How can we end the worrying and fully trust God with our future? Kerryn shares. “When they reached the district of Zuph, Saul said to the servant who was with him, ‘Come, let’s go back, or my father will stop thinking about the donkeys and start worrying about us'” (1 Samuel 9:5). It’s easy to worry, isn’t it? We worry about our children, parents, siblings, friends, health, finances, medical appointments, and so much more. Worry: feel or cause to feel anxious or troubled about actual or potential problems. A small concern can fester and end in fretting, agonizing and even panic. The Bible is full of scriptures to guide us. However, sometimes a situation hits that doesn’t allow us time to look up a helpful verse, or to quietly pray for God to grant us His peace. These are the times when valuable memory verses that are nursed in our hearts, can surface to assist us. I come to this verse often. As soon as I’m still and praying, God gently begins to pry the worry from my heart and I experience His peace refreshing me. Many illnesses are made much worse by stress and worry. That is true for me! Chronic fatigue and immune dysfunction syndrome is characterised by constant and extreme exhaustion, usually made worse by stress. Recently I was reading a number of Corrie ten Boom’s most famous quotes. This one jumped out at me, so I’ve saved it and have read it often. 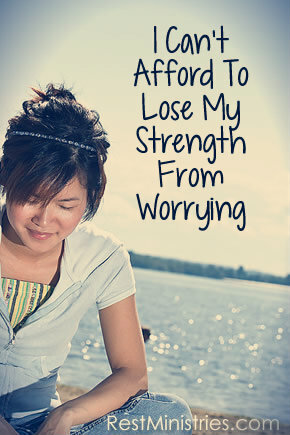 Every ounce of energy I can keep is precious, so why waste it on worrying? I know . . . it’s easier said than done. That’s why God taught us to pray and read His Word. Prayer: Lord, I come to You being honest about how often I worry. Guide me to be still with You, as soon as worry enters my heart. Help me to find verses and strategies that release worry from my heart more swiftly. Pour out Your peace upon me now. Amen. Kerryn Wright lives with her family amongst the gum trees in South Australia. She was a special education teacher prior to chronic illnesses. Her husband is carer for three of their family, who have chronic illnesses and disabilities. God has always guided them through life’s challenges, often in surprising ways. What has been your most helpful verse to release you from worry? Obviously prayer is the best help and sometimes God gives other strategies that are a reminder to release worry from your heart and mind. Do you have some to share?